A fine and impressive antique Victorian sterling silver rattle modelled in the form of a trumpet; part of our diverse silverware collection. 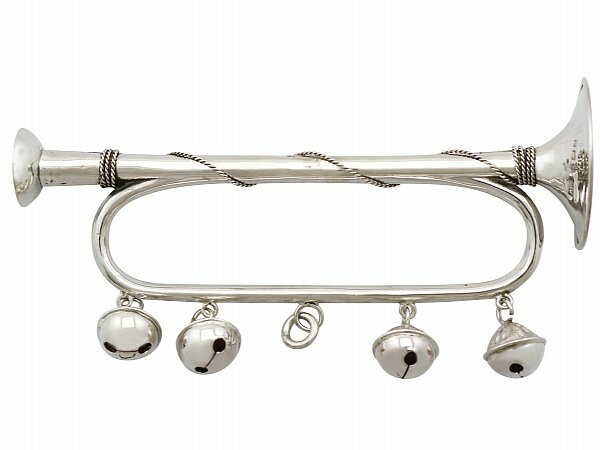 This exceptional antique Victorian sterling silver baby rattle has been modelled in the form of a trumpet. The rattle retains the original sterling silver loop handle with four articulated, functional bells; this portion of the handpiece retains the central ring loop attachment. 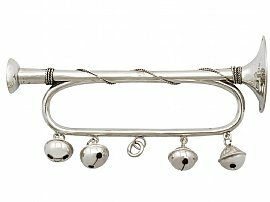 The sterling silver body of the rattle/leadpipe is embellished with an applied rope twist decorated border, entwining the length from the mouthpiece receiver to the trumpet's bell. The embossed body of this antique baby rattle incorporates a whistle, accessible from the trumpet's mouthpiece. This Victorian baby rattle is an exceptional gauge of silver and exceptional quality for its type. This impressive example of antique silverware is in exceptional condition in keeping with age and type. Full British hallmarks struck to the surface of the trumpet's bell/cone are all very clear. Reflections in photographs may detract from the true representation of this example of Victorian silverware. Diameter of trumpet cone 3.4cm/1.3"